Corporate Profits Take Permanent Vacation In Caymans And Bermuda : The Two-Way According to a study, 367 of the companies on the Fortune 500 have at least one subsidiary in a tax haven country. The study found companies are holding $2.5 trillion in profits offshore. 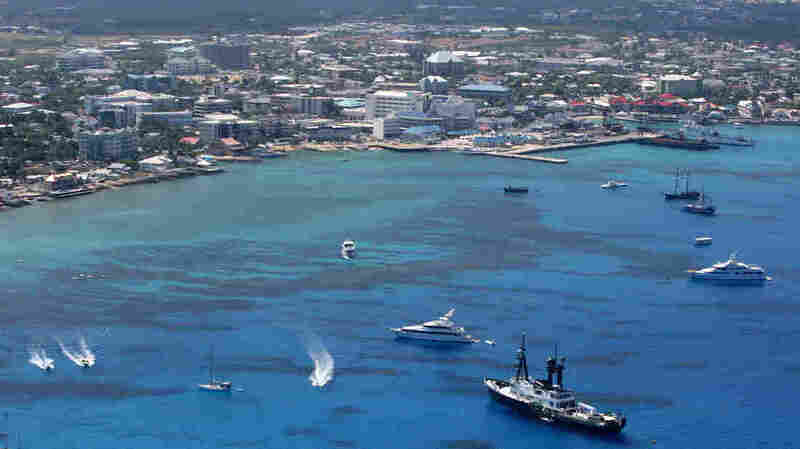 George Town in Grand Cayman, Cayman Islands, is the home of many international banks and offshore companies. A new study shows the Caymans hold $46 billion in multinational corporate profits, far more than its own $3 billion economy. Tax avoidance has been in the news from Apple to Donald Trump. A new study by Citizens for Tax Justice looks at how widespread the the practice is. The study looked at Fortune 500 companies and how they used tax haven subsidiaries to avoid paying taxes on their income in 2015. One of the practices that has become standard for big companies is to create subsidiaries in a country that has no corporate or income tax. According to the study, 367 of the companies on the Fortune 500 have at least one of these subsidiaries. The study found these companies are holding $2.5 trillion in accumulated profits offshore for tax purposes. "All told, these 367 companies maintain at least 10,366 tax haven subsidiaries. "The 30 companies with the most money officially booked offshore for tax purposes collectively operate 2,509 tax haven subsidiaries. "The most popular tax haven among the Fortune 500 is the Netherlands, with more than half of the Fortune 500 reporting at least one subsidiary there. "Approximately 58 percent of companies with tax haven subsidiaries have set up at least one in Bermuda or the Cayman Islands — two particularly notorious tax havens. The profits that all American multinationals — not just Fortune 500 companies — collectively claimed they earned in these two island nations according to the most recent data totaled 1,884 percent and 1,313 percent of each country's entire yearly economic output, respectively." Matt Gardner, executive director of the Institute on Taxation and Economic Policy, is one of the study's authors. He says: "In many tax havens, it's easier to set up a subsidiary than it is to get a library card. Very often there is little asked of the company in terms of who owns it [and] what they're doing with it." The Securities and Exchange Commission requires publicly held corporations, to disclose how they interact with the federal tax system — how much they pay in U.S. taxes, how much they pay abroad, how much cash they hold abroad for tax purposes. The study analyzed disclosures mainly from corporate reporting. Gardner says a hallmark of Bermuda and the Caymans is that they have little in the way of a tax system. According to the study, nearly half of the money that is held offshore is parked on one of the two island nations. "Is there a chance that they're actually doing something real in these countries? And pretty clearly the answer is: no." says Gardner. He points to the fact that the entire economy of the Cayman Islands is $2.7 billion, according the country's Economics and Statistic office. According to the study, U.S. multinationals claimed they earned $46 billion in the Cayman Islands, a figure that far surpasses the size of its whole economy. "Very clearly these are profits that are being earned in the Caymans on paper only," says Gardener, "and the economic activity generating these profits is taking place somewhere else, most likely in the U.S."
Gardner points out that this activity is completely legal, but he says his group is fighting for changes in federal tax laws. To those who say avoiding taxes is the responsibility of corporate managers, Gardner responds, "Concealing their profits in a post office box in Bermuda may be a highly effective strategy for avoiding tax but it's a terrible strategy for building a company." Gardner says the billions of dollars held in these two islands are effectively being "stashed in a suitcase under a bed." He says companies could be investing in meaningful ways, such as building infrastructure in the U.S. or other countries, investing in research and development or adding production capacity. "They're not doing that with this cash," he laments. That, he argues, is "fundamentally against the interest of their shareholders."